Here’s the thing about soup – one bowl is NEVER enough. Soup is so warm and satisfying, its hard to stop yourself from getting a second helping! Or third! But, when so many delicious soups are jam packed with cream and other not so healthy ingredients, you really should stick to the one bowl! 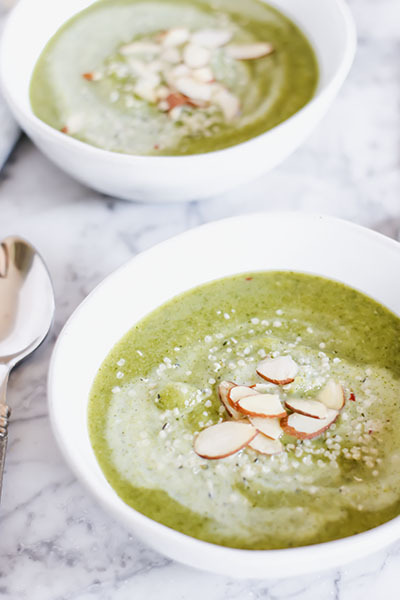 With this 3-Ingredient Broccoli Soup, WORRY NO MORE! Rich, creamy, and delicious – yet made with ONLY THREE INGREDIENTS!! Over time I have learned how HUGE of a difference any recipe can be when you use broth rather than water. 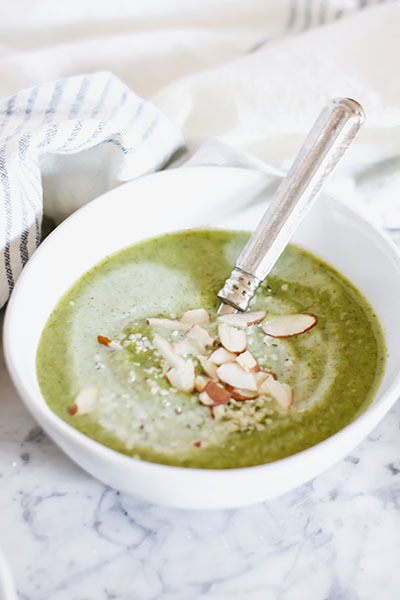 This recipe was inspired by a recipe from Broma Bakery – Sara made her broccoli soup using just broccoli and water! Amazing. However, I found that using a broth instead of water – and adding and onion, made the soup more fitting to my personal tastes! You of course should try both variations of the recipe and see which you like better!! 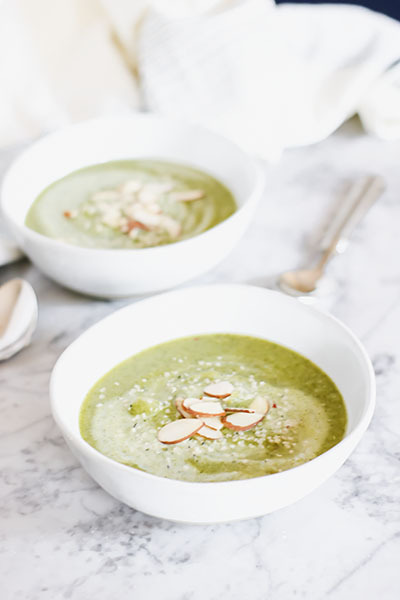 This soup tastes so incredibly yummy – and each time you make it you can totally change it up with different seasoning variations or toppings to make the flavor your own. This time around I topped mine with some hemp hearts and sliced almonds which was DELISH! Of course there are always the classic soup toppings – crackers, cheese, bacon – yum. When it comes to soup, there are TWO key additions that well make your soup even more delicious – texture and flavor. Sour cream and creme fraiche will make your soup even more creamy. 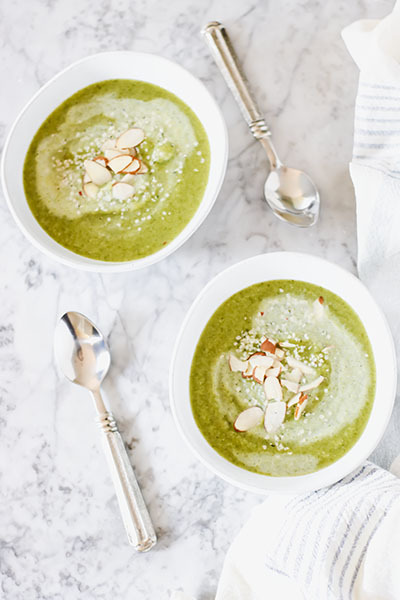 Crackers, hemp hearts, or nuts will add texture variety to your soup. And of course toppings like scallions, bacon, and cheese add incredible flavor. Try one, try them all! And of course, let me know what you think! 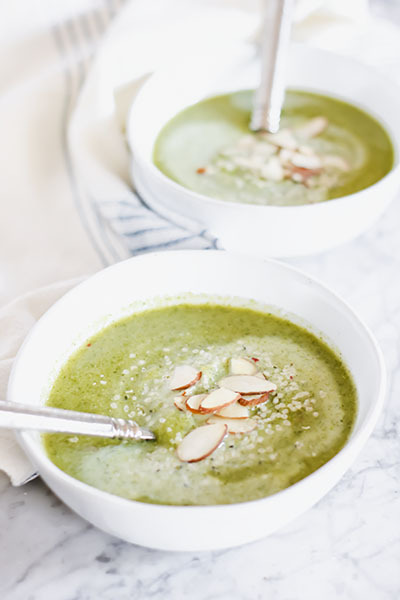 This incredibly healthy 3-Ingredient Broccoli Soup is delicious!ly creamy and satisfying! It will warm you up from the inside out! In a large pot, combine broccoli, onion, and broth, partially cover - heat until boiling, then lower to a simmer. Cook for 8-10 minutes, or until broccoli is easily pierced with a fork. Use a slotted spoon to remove broccoli and onions from pot, reserving broth. Add 1 cup of reserved broth, salt, pepper, and red pepper flakes to broccoli. Use an immersion blender to pulse all ingredients together - adding more broth 1/4 cup at a time if necessary. Serve warm with roasted nuts or hemp hearts. Adapted from a recipe by Broma Bakery.